Serg and Patrick get into literature with films based on books. Special guest indie comic book creator Mark Martinez ("Samuriachi," "Devil Mask") stops by to talk about John Boorman's "Excalibur." We also head out "On Her Majesty's Secret Service," venture "20,000 Leagues Under the Sea," and Criterion of the Month has us end up "Fear and Loathing in Las Vegas." Finally, due to Serg forgetting how calendars work (five Fridays in August, not four), we conquer the world of Canada in "Scott Pilgrim vs. the World." Ep. 94: 007 revisited - "On her majesty's secret service"
Bond is back! The hosts discuss George Lazenby's only turn as the most famous spy of all-time James Bond in 1969's "On Her Majesty's Secret Service." Listen as they talk about the behind-the-scenes drama, Bond's foray into marriage, possible stunt deaths an underwhelming Blofeld and a plot that is quite bizarre. Ep. 95: Revisited - "20,000 Leagues under the sea"
We have a whale of a tale to tell you all as we head "20,000 Leagues Under the Sea" to revisit the 1954 Disney live-action classic. Listen as we discuss the legacy of the film and its influence on Disney Parks design, Walt Disney jokes a plenty, and how dated the film is now. Also, how in the actual hell is Kirk Douglas is still alive? Comic Creator Mark Martinez ("Samuriachi," "Devil Mask") stops by to join the hosts to pull the Arthurian legend from the stone in the form of 1981's "Excalibur." Listen as they get in an epic discussion about the parade of Irish accents, old school (and messed-up) misogyny, the unironic use of "O Fortuna," Boorman's insane production and, unfortnately, "Black Knight." Ep. 97: Criterion of the month - "fear and loathing in las vegas"
Bat Country comes to terrifying life via the drug-fueled gonzo world of Hunter S. Thompson with 1998's "Fear and Loathing in Las Vegas." Listen as the host discuss what is the American Dream, Bencio Del Toro's fantastic turn as Dr. Gonzo, Terry Gilliam's manic vision and Thompson oozing out of Depp's performances. Plus, the September lineup is revealed a bit early! ep. 98: revisited - "scott pilgrim vs. the world"
Comics? Yes. Sweet tunes? Yes. Video game references? Yes. Having to defeat seven evil exes? Well, we aren't sure about that one. 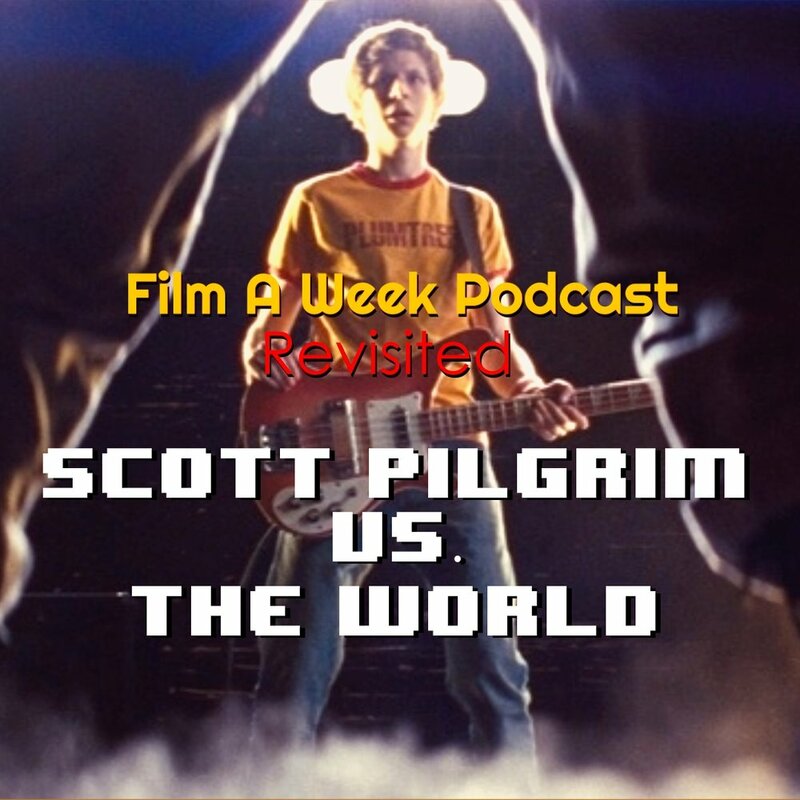 We add another Revisit episode to the list (poor planning on Serg's end) as we see 2010's "Scott Pilgrim vs. the World." Listen as we discuss Edgar Wright as a genre filmmaker, Michael Cera's leading man turn and how the film achieved cult status despite its box office reputation.